This morning we had an exotic guest on our patio. 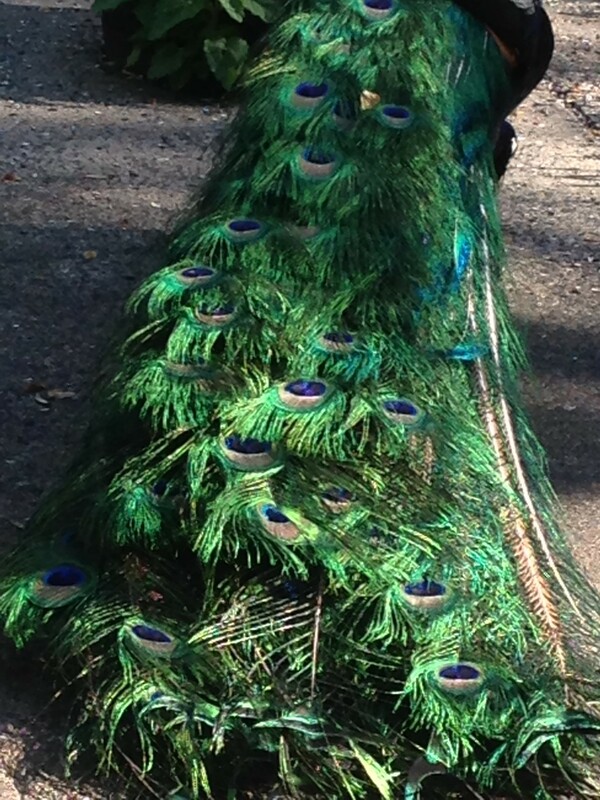 A beautiful peacock (who roamed the neighborhood last year) paid his first visit since our long cold winter. 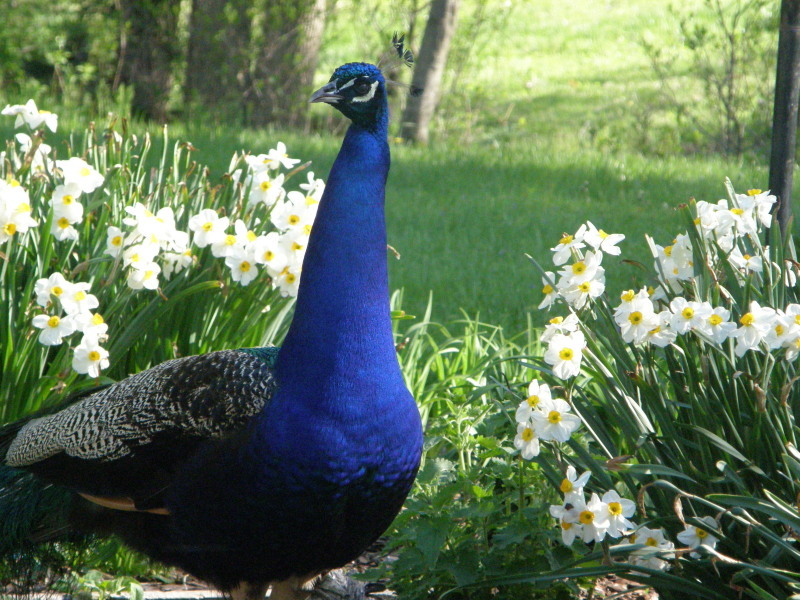 He was an eye-catching sight amid the spring greenery and blooming narcissus. 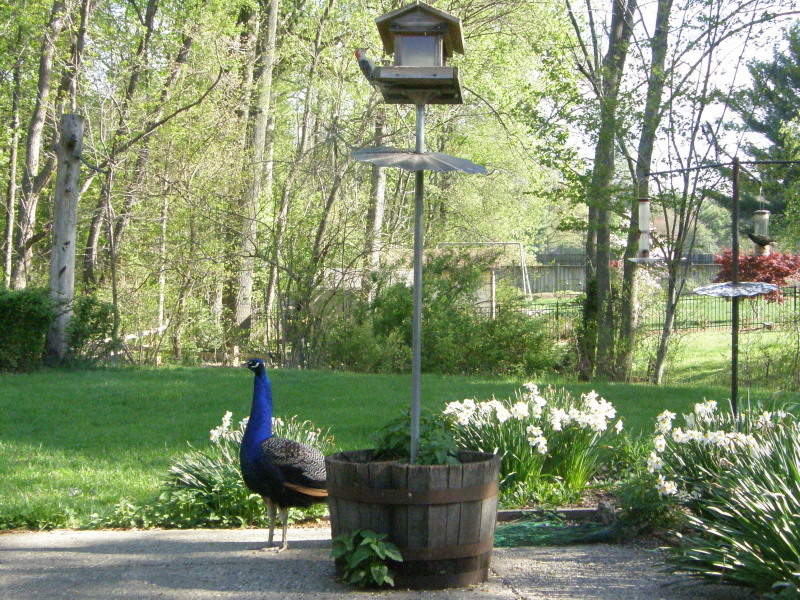 A barrel on our patio holds a bird feeder. 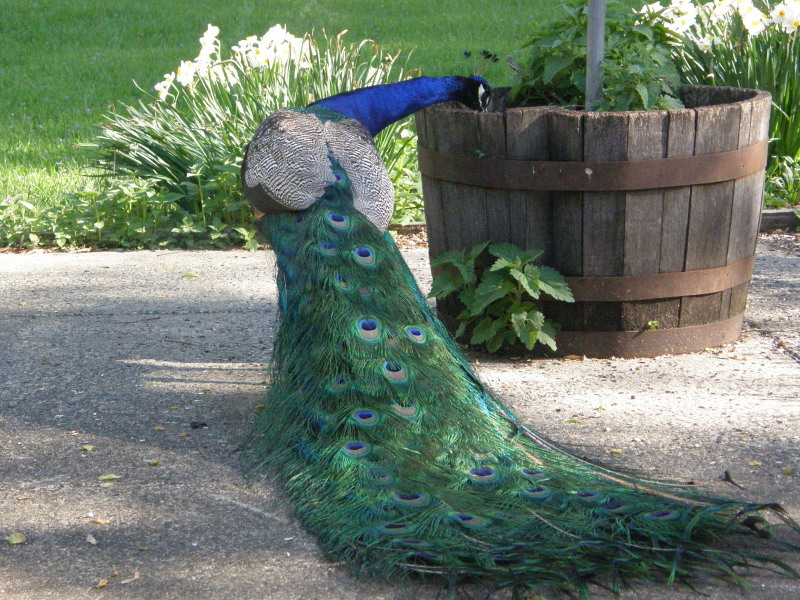 The peacock stepped about the barrel, gleaning dropped seeds, trailing his long train behind him. Hunting for breakfast, he even investigated in the barrel itself. The little backyard birds fed at the feeder above him or flew past to other feeders. I wondered whether they felt any kinship with this super-sized intruder. 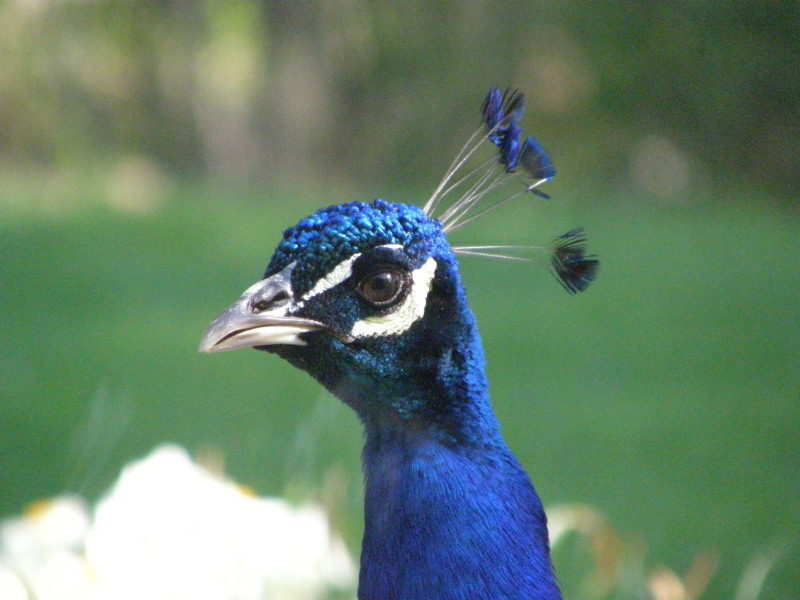 The peacock had an aristocratic profile, with his large dark eye highlighted by a creamy stripe and a crescent-shaped patch of bare skin. His crest feathers had lost some of their tips but even so, they looked like a regal crown. The base of his glorious blue neck was bright green, the intricate designs of his wing coverts formed a black-and-white tapestry over his back, and when he stretched out his wing, we saw rich chestnut primary feathers. The eye-spots on the feathers of his train surrounded each dark “pupil” with those colors and more. I wished for a peahen whose presence would cause him to truly strut his stuff on those large scaly feet, raising his train into a stiff and dazzling fan. But alas, his audience consisted only of two humans and three cats. 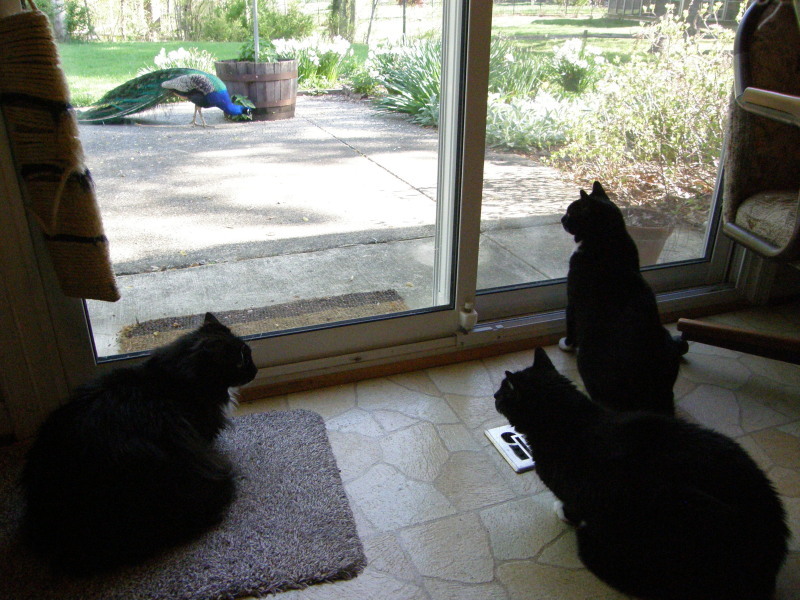 We were all crowded around the sliding glass door in the kitchen; the cats were half-scared and growling but as wholly fascinated as Lou and I. Lou stepped outside to scatter more seed. The peacock retreated through the patio garden to the lawn, but soon came back. By the time he finally wandered away, his crop was so full I wondered how he could turn his head. Some mornings have a bit of magic about them….